DV MPEG4 Maker is a software tool that helps you create MPEG4/DIVX/AVI/WMV video clip files from your digital camcorder(1394 interface). 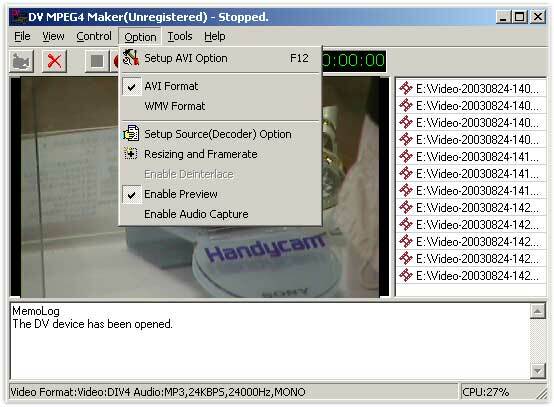 DV MPEG4 Maker includes a simple video player to help you to play the video. The REAL-TIME recorder can directly record to MPEG4 AVI/WMV format. It has a pause function. It features a long-time recorder,a real-time video capture system.It's high speed comes from it's being optimized by MMX assemble code. DV MPEG4 Maker is a software tool that helps you create MPEG4/DIVX/AVI/WMV video clip files from your digital camcorder(1394 interface). DV MPEG4 Maker includes a simple video player to help you to play the video. The REAL-TIME recorder can directly record to MPEG4 AVI/WMV format. It has a pause function. It features a long-time recorder,a real-time video capture system.It's high speed comes from it's being optimized by MMX assemble code. It is characterized by 'dynamic A/V synchronization' and Low level AVI file writer.